A Notice of Assessment or NOA, is a statement from the Canada Revenue Agency notifying the taxpayer of the amount of tax they owe, if any, the amount of tax already paid, if any, tax credits received and contributions to a Registered Retirement Savings Plan. If there is a refund owing, a cheque will usually be included with the NOA. If there is an amount owing payment information will be enclosed. 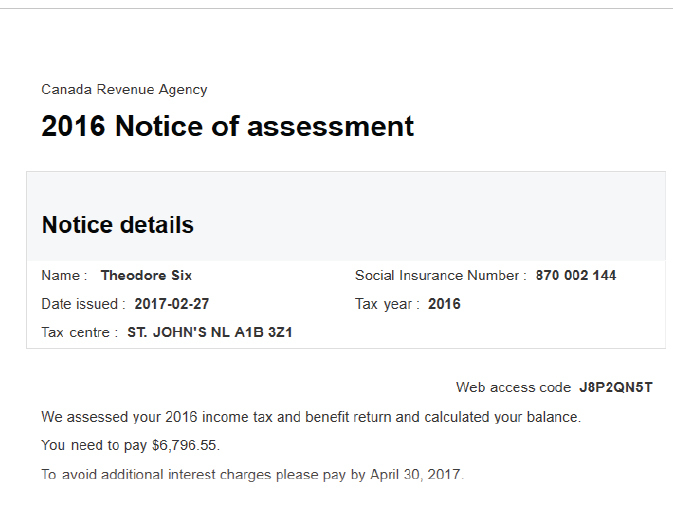 The Notice of Assessment is received after the taxpayer files their tax return and the return is reviewed by the Canada Revenue Agency. It is a two page document, showing the taxpayer name, taxpayer insurance number, tax year and tax centre. It will then provide a summary of income, deductions, credits, taxes previously paid, etc. Notice of Assessments (NOA’s) from Revenue Canada are the single most important document required by lenders when applying for a mortgage particularly if you are self employed or are needing to include overtime and/or bonuses for income qualification. NOA’s are an annual statement sent by Revenue Canada to taxpayers detailing the amount of income tax they owe. It includes the amount of their tax refund, income earned, tax credit and income tax already paid etc. While you should keep all Notice of Assessments received from Revenue Canada. It is very important to keep on file at least your 2 most recent years when qualifying for a mortgage. By using My Account , you can view and print detailed information on a particular assessment or reassessment to your income tax and benefit return for the current year or the 11 prior years. You may be able to get an income and deduction printout of your notice of assessment or notice of reassessment. In your Canadian income tax assessment appeal, you will need to explain the reasons for your objection. or by writing to the Chief of Appeals at the Canada Revenue Agency tax services office or tax centre in your area. The Canada Revenue Agency will then review your objection and make a decision about your case. If you disagree with the Canada Revenue Agency's decision about your Canadian income tax objection, you can take your assessment appeal to the Tax Court of Canada.